The dilemma with 9-11—beyond just unearthing more evidence that the federal government’s conspiracy theory is the height of absurdity—is what to do with all the evidence. You can expose a lot of the “who” and the “how” of 9-11 regarding the forces behind the Twin Towers’ destruction, the damage to the Pentagon and the Pennsylvania event. But then what? Will the American citizenry push the seemingly immovable government story aside and achieve justice by actually jailing the real 9-11 perpetrators—whoever they may be? The government says everyone centrally responsible for the crimes of 9-11 perished in the attacks. And while the United States military-intelligence complex has water-boarded many a suspect with obscure names, no one has gone to jail over 9-11. Meanwhile, however, a couple of hard-working analysts this writer has interviewed are pondering this matter. Texas architect Ron Avery, one of the two participants in a September 9 debate in Austin on how the three World Trade Center buildings were destroyed on 9-11, was elated to see the Central Texas Republican Liberty Caucus (CTRLC)—a major source of Representative Ron Paul’s home-state support structure that has long been reluctant to fully confront the 9-11 issue—finally bring the issue out in the open by sponsoring the debate. Thus, the Austin debate was seen by some as a potential turning point in a stifling political atmosphere, where political parties and candidates would rather avoid troubling questions about 9-11. Among political candidates, 9-11 has been a tough issue. Debra Medina, a volunteer in Paul’s 2008 presidential campaign, in 2010 challenged Texas Governor Rick Perry during his re-election bid and was neutralized with surprise 9-11 questions on radio from Fox News “presstitute” Glenn Beck, which made her quit. And while Paul often says that armed pilots could have prevented the supposed 9-11 skyjackings, he still will not fully challenge the official 9-11 story. Significantly, the CTRLC’s national president, Dave Nalle, attended the Austin debate. He’s skeptical of Avery’s 9-11 views, but he at least sanctioned the debate so members could make up their own minds. And now that Paul is again running for president, there is hope that what transpired in Austin could help change the climate in favor of a broader 9-11 inquiry that will encourage Paul to say more about 9-11 and help dislodge the conventional story. 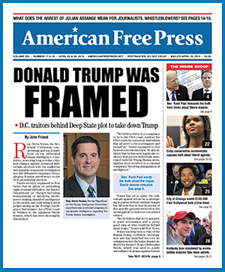 This newspaper, among other alternative media, has been aggressively challenging the government’s 9-11 conspiracy theory over the years, with the much-in-demand September 5, 2011 special 9-11 edition of AFP being the latest effort in that initiative. Dozens of copies were distributed at the debate. The government’s story is weakening, but it’s difficult to overcome the conventional story. As Avery told AFP, “Medina and Paul won’t face the initial thing that it [the conventional 9-11 story] is a hoax to start with.” Avery says all political candidates concerned about 9-11 need to learn how to breach this subject and challenge the media to make the media back down, thereby getting 9-11 truth to a higher level that is harder to discredit. Notably, radio host and longtime 9-11 activist Kevin Barrett agreed with that assessment when he interviewed this AFP writer on the air on September 19. Avery, known for producing “911 Undeniable Conspiracy,” a DVD presentation that addresses viewers as if they are jurors, seeks to establish in the legal sense that a genuine conspiracy took place on 9-11. In so doing, Avery seeks to demonstrate that the government’s version cannot survive scrutiny. He shared some of that approach at the Austin debate, taking on former National Aeronautics and Space Administration employee Jeff Larson, who insisted that fires and gravitational collapse were enough to down the structures. It was not easy for Larson to maintain that stance. But everyone in the Austin restaurant agreed that life in America was drastically altered in the wake of 9-11. “Regardless of what happened on 9-11, our country has changed in mostly irreversible ways that most people are not happy with,” commented Pierre de Rochemont, an outspoken CTRLC member who now doubts much of the government story—after a long, painful journey over the last 10 years. Having been in New York just after 9-11-01, he finally got past the deep emotionalism of the 9-11 events, so he could break free of the stubborn mindset that the government’s version must be true. The debate audience leaned in favor of Avery’s view that the 110-story Twin Towers were built entirely too well to be so thoroughly destroyed by jet impacts, the ensuing office fires and mere gravitational collapse. Avery noted that only an approximately four-floor section (out of 110 stories) directly impacted by the airliner in the South Tower was burning, yet about 77 floors below that fire area could not possibly have crumbled, especially so quickly and completely, without something blowing them to smithereens. “There was nothing but cold hard steel above those four floors, and nothing but cold hard steel below them,” Avery remarked. All that aside, Aaron Bolinger, a longtime, trusted contact, told this AFP writer on the AFP Hour radio show on September 19 that his organization, the National Veterans Committee for Constitutional Affairs, has produced an 86-page booklet, State Investigations Into 9-11, on pursuing 9-11 justice through state legislatures, since the states are the true “principal” in the federal-state relationship and the federal government is the agent of the states. Bolinger, a stalwart critic of the “Real ID” personal identification system that would contain various biometric information on cardholders and render them more track-able by authorities, says that without the “big lie” that is the conventional 9-11 story, there would not be any Real ID proposal. Fortunately, about 17 states in varying ways and degrees have balked at implementing the federal Real ID Act. Bolinger stresses that the murders of 9-11 were really state crimes, that it was wrong for the states to relinquish the 9-11 investigation to the federal government, and that the legal framework of the nation’s state legislatures is such that House or Senate committees at the state level could initiate a real 9-11 probe and subpoena witnesses. Pennsylvania’s legislature is especially well-structured for this approach, he said, pointing out that either legislative chamber could get started, perhaps by the current state representative whose district includes Somerset County introducing an investigative measure regarding the rural locale of Shanksville, where Flight 93, claims the federal government, went down on 9-11—leaving no wreckage whatsoever. Avery and Bolinger are thus dedicated to taking 9-11 to a new level: Beyond exposure, seeking solutions. Editor’s note: Go to www.911uc.org for more on Avery’s presentation.